Beautiful country setting on 10 acres down a quarter mile lane with no visible neighbors! The property is surrounded by farm fields and forest. The house is a restored 200+ year old stone farmhouse with original random-width hardwood floors throughout. Master bedroom has a queen bed, second bedroom has a queen-size bed, third bedroom has a full/double-size bed and a full-size crib, and the fourth bedroom has twin-size bunk beds. Perfect for a quiet romantic get away or a fun family vacation where the kids can run and play outside with no danger of passing cars. Enough space for a wedding or a family reunion out on the lawn! Great location close to Lancaster County/Amish attractions, Dutch Wonderland, outlet shopping, 20+ museums, hot-air balloon rides, Strasburg Railroad and the list goes on. Need a break from your busy life? : Find yourself listening to the birds and the crickets as you relax in a rocking chair on the front porch overlooking an expanse of green lawn and trees. No neighbors, no buildings, no traffic - just peace and quiet for you to savor. Lancaster County Amish Country: Perfect location to check out all the local Amish attractions and enjoy the drive through the rolling farmland to get there! 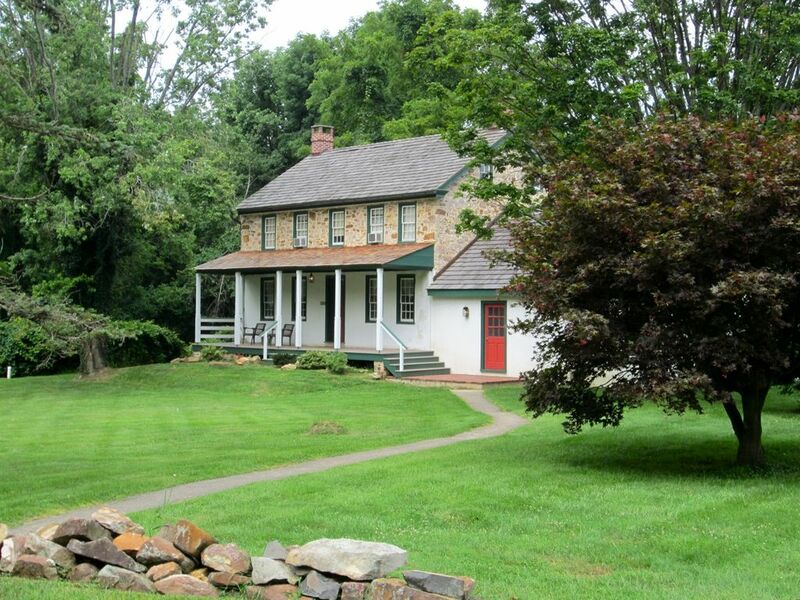 The property is very private, yet is only 15 minutes from the Pennsylvania Turnpike. Shop local businesses selling quilts, antiques, hand-made furniture and countless farm stands to get all the fresh produce you can eat! 30 minutes to Dutch Wonderland, Lancaster Outlet Shopping, American Music Theatre, Sight & Sound Theatre, Strasburg Railroad, Reading Outlet Shopping and so much more. 1 hour, 15 minutes to Hershey Park and Chocolate World. Two parks within two minutes of the property: Historic Poole Forge is a township owned park with a great children's playground, pavilion and picnic benches for a cookout, and a 150 year old historic covered bridge that you can drive though and is great for photos with you and your family! Just up the hill from our home is a county owned park called Money Rocks that has an easy 30-minute hike to the top of the mountain for a gorgeous view of the scenic countryside. I grew up in Lancaster County and in this house! I moved away after college and getting married, but returned to the area after having children and spent a year restoring the farmhouse. My husband and I like to restore old homes and we are currently working on a historic inn in Churchtown, PA. I grew up in this house and we bought it from my parents and restored it. We lived in it for a few years before deciding to rent it out as a vacation rental because we loved the property and house and didn't want to sell it. The only reason we moved out is because we bought another 200+ year old stone home just five minutes away that we are currently restoring. The area is perfect for relaxing and enjoying the peace and quiet of the countryside, strolling through local parks, watching horse and buggies go by, visiting the numerous historic districts, museums and various Amish and Pennsylvania Dutch attractions in Lancaster County. The property itself is the perfect getaway from hectic lives - you might not want to leave! Only bathroom is upstairs with a full-size shower/tub combo. Towels are provided. (2) HDTV in living room and master bedroom. Basic cable only. Bose wave radio with cord to connect to your phone. Large lawn of several acres with complete privacy! No visible neighbors and no street traffic since the house is a quarter mile from the road. Front covered porch and open back patio with knee wall. Huge cedar play set outside for kids of all ages with 7' slide, tire swing, fire pole, rock wall, sky bridge, infant swing and more! Sand box under the shade of a large magnolia tree. Basketball court (basketball provided) and plenty of grass to run in! Two full-size picnic tables are on the property for outdoor entertaining. Amazing get away! Our family enjoyed every minute of our stay, will definitely return again. It was very peaceful, quiet and relaxing. We really enjoyed the property and would love to stay there again! We had a great time bringing in the new year with our loved ones at this property, we would recommend it again. Peacefulness and kids don't always go hand in hand... at least, not with our boys? :)... but Sharon's wonderful farmhouse checked both boxes in a BIG way. My city kids loved having a swing set to play on, a sandbox to play in, a tree to climb, a basketball court for shooting hoops and riding their bicycle--and we ate all of our meals around the fire pit. For me... watching all that happen with a mug of hot coffee in hand... from the porch and wandering the front and side yards... was perfection. (The crib "just like home" said our very little one was such a bonus.) Sharon, THANK YOU! You were so kind to let us stay despite such last-minute notice and we also appreciated your September Farm Cheese recommendation. We loved the people at Town Hall Restaurant, too. Just one request: Would you please send us a photo of that magnificent magnolia tree in bloom? I just can't imagine how spectacular that must be. Thr house itself is very well taken care of, very clean, new furniture and towels, beds and linens were super comfy. It was wonderful to put our baby in a real crib rather than a pack n play, she slept like a log. Unfortunately the weather was very cold the weekend we were there so we were trapped indoors a bit, which was hard. I would definitely rent this place again but just in the warmer months to take advantage of the big yard and fire pit. Rolling hills of farmland surround the area. You'll drive by pastures of cows, horses and enjoy the view on the way to the property, which is in the small town of Narvon, PA, where there are no traffic lights! Just up the hill from the property is Money Rocks County park with a short walk to a gorgeous overlook. Also a great township park, Historic Poole Forge, 2 minutes from the house with a covered bridge, great playground and picnic areas along the Conestoga Creek. 30 minutes from Lancaster, 30 minutes from Reading, 1 hour from Hershey, 1 hour from Philadelphia, 1 hour from Harrisburg, 2 hours from Baltimore, 2.5 hours from New York City, 3 hours from Washington D.C. - we're in the center of everything!